How do I change units on a number? In the geosciences, we think about how the Earth works on a variety of scales. 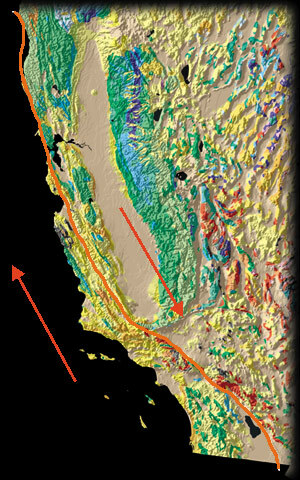 For example, the San Andreas Fault that runs nearly the length of California's coastline is over 1200 km long. But we talk about movement on the fault in terms of mm per year. So, we have to be able to think about thousands of km and a few mm when talking about the same feature. In addition, a geoscientist who lives in the United States needs to be able to think in terms of English and metric units - the public thinks in terms of English units (miles, gallon, etc.) and the scientific community uses SI units (kilometers, liters, etc.). This may seem difficult at first, but it is crucial for anyone studying geosciences to be able to move easily from one unit to another (with a little calculation, of course). Luckily, there are some simple steps that, if followed, can help you complete unit conversions with relative ease. How do I do a unit conversion? You can do any unit conversion if you follow a few simple steps. Although there is no single "right" way to do unit conversions, these steps provide one way to learn to do unit conversions. DO NOT SKIP ANY STEPS! Although it may seem tedious, working through unit conversions requires that each of these steps be followed so that you can be sure that you end up with what you want, especially when you are just starting out with learning to do unit conversions. Photo of conversion of speed limit signs near the US - Canada border. If you are converting from one metric unit to another, this list of metric prefixes (Acrobat (PDF) 7kB Aug31 11) will be useful. When converting from metric to imperial (sometimes called English) units (orvice versa), this conversion chart (Acrobat (PDF) 40kB Sep3 09) might be helpful. When you do any unit conversion, you should always know what units you started with and what units you want to end up with. This is key to success at unit conversions. The steps to successfully completing a unit conversion are outlined below. To illustrate the steps, lets use a geologic example: In Southern California, slip on the San Andreas Fault is on the order of 25 km/Myr. How many cm does the San Andreas Fault move in one year? Write (copy) out the units that you are given as a fraction. In this case, you are given km/Myr. OR you could write that you have kilometers (km - a length or distance) and Myr (which is Megayears or million years - a time). In the example, you are asked to convert km/Myr to cm/year, so you want to end up with cm/year. OR you could write that you want your units to have centimeters (cm; a length or distance) and years (yr; a time). Determine appropriate conversion factors. 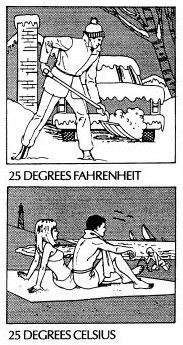 Use tables in your textbook or download one of the tables listed above (for this particular example, you probably only need to know the prefixes for metric system (Acrobat (PDF) 7kB Aug31 11)). Evaluate the appropriate arrangement for conversion factors. That is, copy the conversion factor(s) from step 3 into fraction form so that the units end up canceling. Remember that when you multiply fractions (as you will in step 6 below), you can cancel units ONLY when they appear in the numerator of one fraction and the denominator of another. Set up the conversion by writing the fractions in a row with multiplication signs in between. Evaluate. Do the original units cancel so that you end up with what the question is asking for? If not, repeat steps 2 and 3 until they do! (like units are canceled with the same color in the example above) Note that the only units that are not canceled are cm (in the numerator) and yr (in the denominator) so the units on your answer will be cm/yr! Now, lets do some arithmetic: To complete the conversion, we multiply all the numerators and then all the denominators (or multiply across the top and bottom). When fractions are multiplied, you need to keep track of numbers on the top (also called the numerator) and bottom (also called the denominator). It's easier to keep track of these numbers if you write the fractions like this: . In this case, the numerator is 25 km and the denominator is 1 Myr. To multiply fractions, treat top and bottom numbers separately (multiply top numbers and then multiply bottom numbers). Reduce the fraction by dividing numerator by denominator once you have the top and bottom multiplied. This can also be written as 2.5 cm/yr (said "centimeters per year"). EVALUATE (again). Is this a reasonable number? Considering that plate motions are in the range of 1-10 cm/yr, 2.5 cm/yr is a reasonable answer! to use while completing the practice problems. so that you only have to divide 25 by 10. If you are rusty about what the prefixes mean for the metric system, you can review the order of magnitude for a "femtogram" or "gigabyte" or any other SI unit using the metric prefixes (Acrobat (PDF) 7kB Aug31 11) document available earlier on the page. Where are unit conversions used in the geosciences? Plate tectonics - converting rates of plate motion, etc. Rivers and Streams - converting rates of flow, slope, etc. Glaciers - converting rates of flow (or retreat), etc. Geologic time - converting time, rates of deposition, etc. I still need more help! (See the links below for more help with unit conversions). NIST (National Institute of Standards and Technology) has an extensive list of weights and measures. There are specific tables for metric units of measure, US units of measure and US and metric equivalents. SOSMath has several tables of conversion factors for linear measure (length/distance), square (area) measure and http://www.sosmath.com/algebra/unitconv/unit4/unit4.html 'cubic (volume) measure'. The geology department at Rutgers has a list of important conversion factors in geology. The engineering department at Auburn University has a long list of conversion factors. Alabama Learning Exchange has a handout about basic mathematical skills needed for the workplace. Alysion.org has a page with step by step instructions for dimensional analysis and some fun with dimensional analysis. Oak Road Systems (Stan Brown) has a discussion of converting units and how to go about it. SOS Math has an entire unit on fractions. These pages include a list of rules for the mathematics of fractions, reducing fractions, multiplying fractions.